The taxi driver didn&apos;t understand us when we told him we wanted to go to Sugerloaf Mountain. 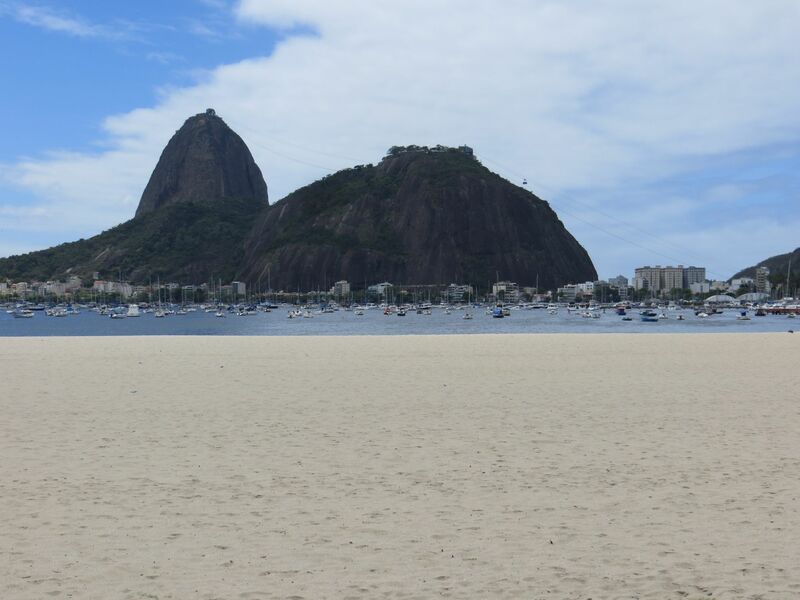 When we showed him the image of Sugarloaf Mountain in the Lonely Planet, he reacted: &apos;Ahh, Pão de Açúcar&apos; and some more sentences which we couldn&apos;t understand. After driving off, he pointed his finger and repeated: &apos;Pão de Açúcar&apos;. After just a few minutes, he dropped us off at the foot of Sugarloaf Mountain, near the entrance for the cable car. Seeing all the barriers, a long queue can be formed. However, there was nobody waiting at the time we entered. We bought our ticket and were able to walk straight to the cable car that was waiting for us. Not cheap though: R$ 65,- per person, but Sugarloaf Mountain is one of those things you should visit at some point in your life. Within minutes, the cable car brought us to Morro da Urca. The smaller brother of Sugarloaf Mountain. Because we will pass the viewpoints here on our return as well, we decided to continue straight towards the next cable car. For the first time, we had to wait. Not long though. When the passengers that came down with the cable car got off, one of them looked at us and started waving. &apos;Uhh, do you know blond good looking ladies in Rio de Janeiro?&apos; we asked to each other. While we walked into the cabin, we realized who was waving at us: it was one of the cabin crew from on board of our plane that brought us to Rio de Janeiro. She of course recognized us, while we did not immediately recognize her without a uniform. Via the open window of the cabin, she said it was very pretty on top and waved us goodbye. She didn&apos;t lie. The view from the top is indeed very spectacular. Christ the Redeemer, downtown Rio and the Copacabana, we could see it all. 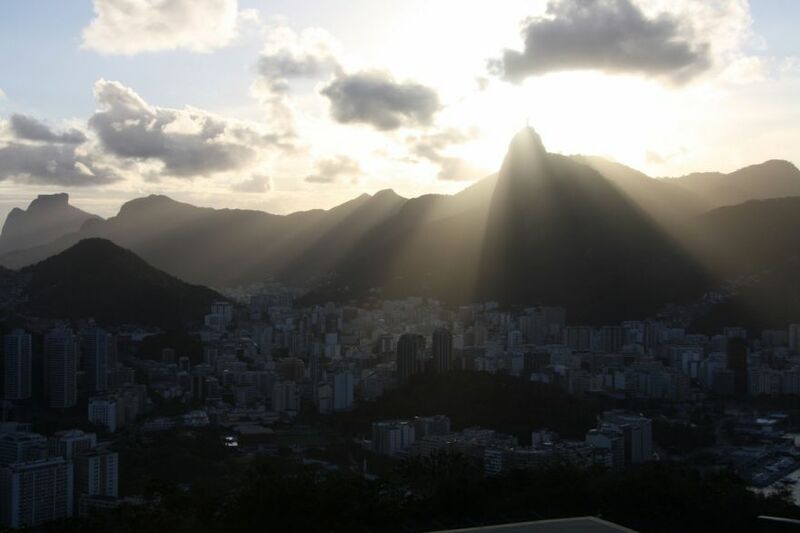 Especially the sun that was behind Christ the Redeemer created a picture perfect setting: beautiful. More people had decided to go the top of Sugarloaf Mountain in the late afternoon, as it was pretty busy on the top of the 396 meter high Sugarloaf Mountain. We had a walk around to see what else we could do besides seeing the sun go down. Well, not a lot. There are some trails that lead down into the rain forest. But, as we didn&apos;t fancy walking all the way down, we didn&apos;t want to walk too far as that would mean we would also have to climb back up again. In the end, we just went back to the viewing point before catching the ride back to Morro da Urca. As we skipped Morro da Urca on our way to the top, we had a walk around. But just like the Top of Sugarloaf Mountain: there is not a whole lot to do besides enjoying the view. 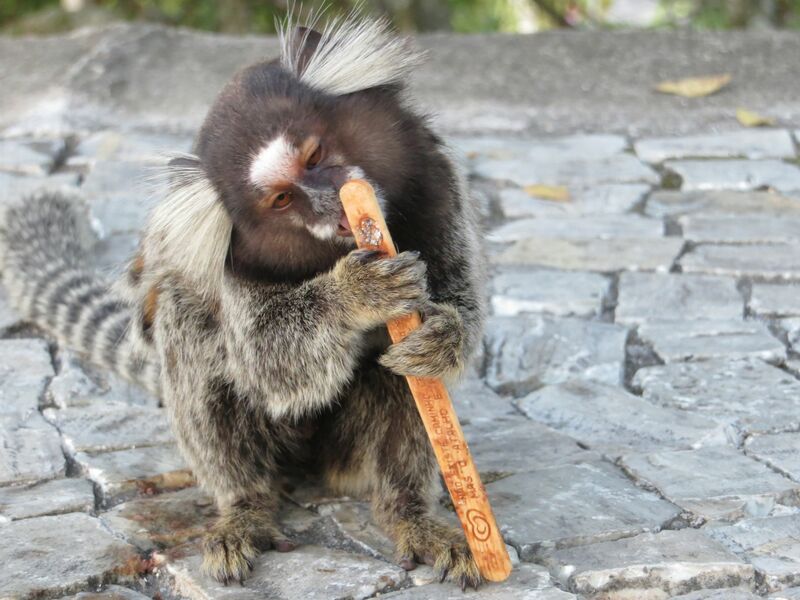 Well, there was a tiny monkey that caused some hilarity. 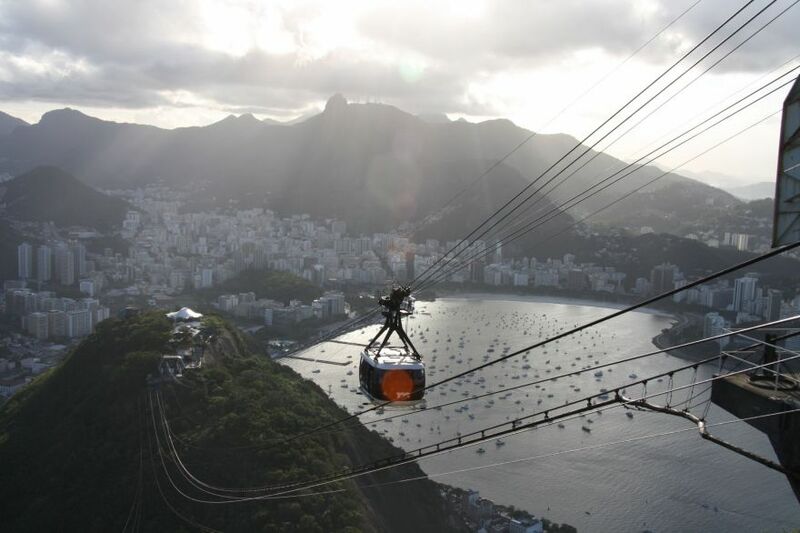 And when we just wanted to take the next cable car down, a group of climbers arrived at the Morro da Urca. Great to see that some people also climb here. Maybe something to put on our bucket list! After taking a few more photographs of the really stunning sun set, we took the cable car down to find ourselves a nice restaurant. 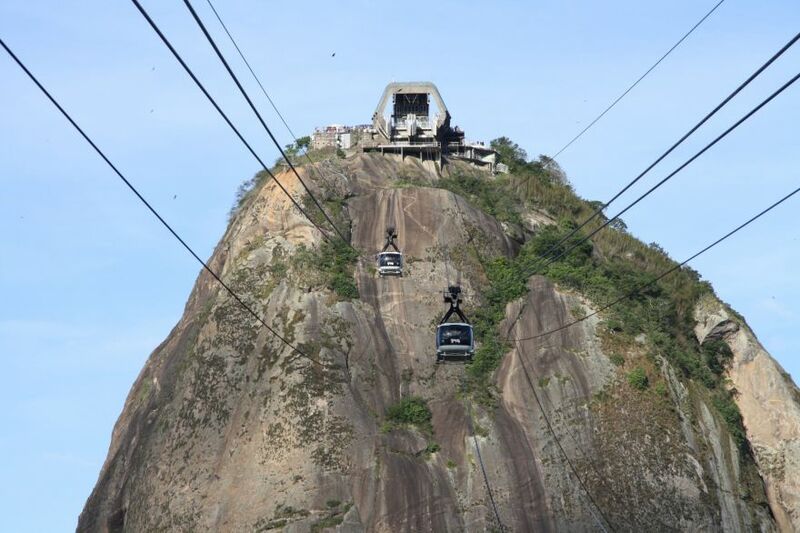 Looking back up to Sugarloaf Mountain, we realize we might have seen the best few of Rio de Janeiro. What an experience!